Alpacas - advertising's creative panacea; audience in tears at Ben Priest leaving speech; and Cannes here we come! So what do you when you can’t find your creative muse? Use an alpaca, that’s what. 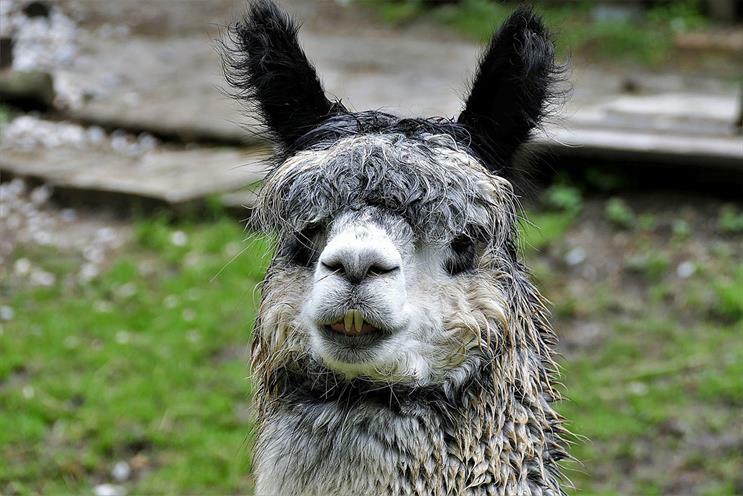 This South American camelid can currently be seen in campaigns for betting firm PlayOJO from TBWA\London and J20 from VCCP. The beasts have previously ridden to the advertising industry’s rescue before – Grey used one in a 2015 campaign for McVitie’s while they have also been seen in Honda idents from Widen & Kennedy. Oh and Mastercard from McCann. And they’ll probably keep appearing given that most creatives get a mental block from time to time. Beers and tears over at Adam&Eve/DDB last week when Ben Priest finally left the building, Elvis style. Ahead of a party for the many friends he has made in the business, there were emotional scenes at the agency where he gave a speech that left most of the staff with damp eyes. 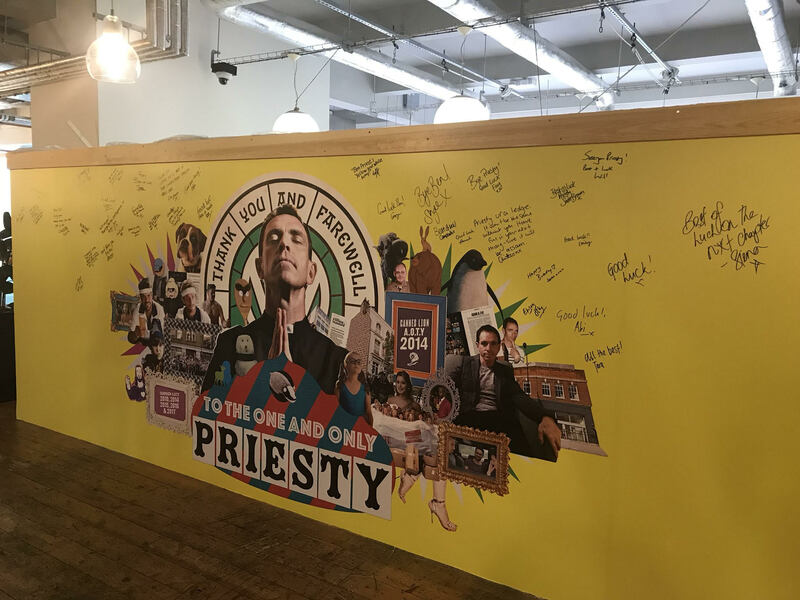 The agency also created a thank you wall in the building (which has got to beat a Top 5 email). Sale of a "good friend"
Michael Kassan sold his media consulting business MediaLink to Cannes Lions owner Ascential last year but there were other potential bidders. Ken Auletta, who has written a new book, Frenemies, about the advertising industry, says Kassan held talks about a sale with his "good friend" Maurice Lévy of Publicis Groupe. If the deal had happened, Diary is sure Kassan would never have allowed Publicis to boycott Cannes this year. 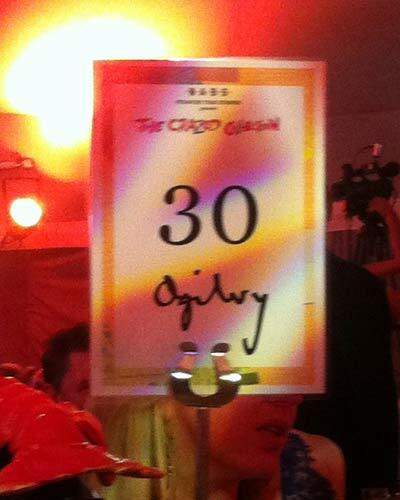 There were shocked faces at the Ogilvy table at Nabs' Stranger than Summer event. But it wasn't the flamboyant dancers causing eyebrows to raise. Oh no, it was - horror of horrors - the table sign which used the agency's old branding. Whatever you do, don't tell Seifert. Anyway, the event, which was attended by more than 900 guests, raised over £165,000 to support people working in the advertising and media industries.